Most business owners are law-abiding citizens who pay taxes, follow legal guidelines and do what they can to create an environment that is safe and secure. Yet sometimes, government regulators and law makers can get carried away creating regulations and guidelines that cause more problems than they solve. 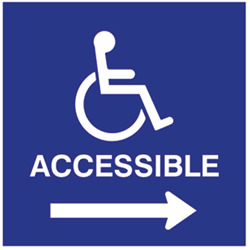 One such example is ADA compliance regulations, including ADA signage, handicapped decals, braille signage and much more. KABC Los AngelesWhile the vast majority of small business owners want to do what they can to welcome disabled shoppers including those in a wheelchair, some now feel that ADA compliance regulators have gone too far. In California, a state with a reputation of a high number of frivolous lawsuits, small business owners can get a $4000 fine for failing to post proper ADA signs, tactile signs, handicap decals and more. According to KABC Los Angeles, these business owners feel they are being targeted by ethically questionable lawyers and plaintiffs who file frivolous lawsuits knowing the business will more than likely pay the fine than take the time to duke it out in court. A small business owner’s best defense against these thoughtless lawsuits is to install proper ADA signs throughout their buildings, properties, and parking lots. Businesses may consider partnering with a Certified Access Specialist recognized by the State of California who can walk through their business and go over areas that may be lacking in ADA compliance. Getting the right braille signage, tactile signage, and ADA decals in place is the best deterrent to being hit with a hefty fine.